The modern cruise ship quay and passenger terminal are situated close to the city center, a 15 minute walk, giving easy access for passengers to the sights of the city. When more than one ship is in port you might be docked at the other side of the city, cruise ship shuttle provided or walk down de Nedre IIa, and then along a footpath next to the houses labeled, “Lindis Irene Enge Valso”. Shuttle buses (50 kr) are also provided by some cruise lines, drop off near Nidaros Cathedral, famous for its organ recitals. 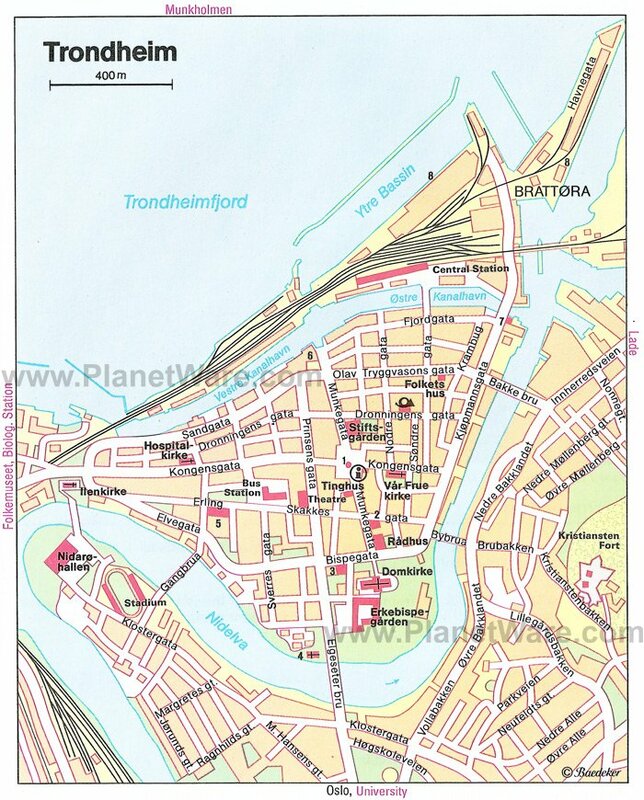 Bus lines 19 and 46 will take you from Brattøra, where the cruise dock is, to the center. Dep. every 30 and every 20 min. The city of Trondheim was founded by the Viking King Olav Tryggvason in year 997 and holds a special place in Norwegian history and culture. It was the first capital of Norway, and is still the city where new kings receive their ceremonial blessing. Situated by the Trondheim fjord , it is surrounded by lovely forested hills with the river Nid winding through the town. It has been, and still is a popular pilgrimage site, an ecclesiastical center, a regional capital and last, but not least; a city of education and research. Today Trondheim is the third largest city in Norway with 165 000 inhabitants. Trondheim is a major university city with more than 30 000 students, and one of the largest high-technology centers in Europe. Trondheim's well established and internationally known university and research community provides resources for many types of businesses and industries. Here, the past and present live side by side in a particularly harmonious fellowship, in a place that people think of as both a small city and a big town. Norway's largest religious and cultural festival, the St. Olav Festival takes place every year in July/August. The festival presents a comprehensive program for all with more than 300 performances. Other annual festivals are Trondheim Chamber Music Festival, Trondheim Blues Festival, Kosmorama International Film Festival and Trondheim Jazz Festival. Most of the museums are within walking distance from the harbor. Trondheim has excellent attractive shops, and offers a broad range of historical attractions and activities. Stretching 120 meters (400 ft) into the sky, the Tyholt Tower was built by the Telecommunications Authority for modern radio and telecommunications. This is a must for tourists as it offers a spectacular view of Trondheim and the surrounding area. It also features a rotating restaurant 74 meters (243 ft) above ground. Trondheim is pedestrian friendly with many attractions located in the city center. Walking Tour. Trondheim has 90 city bikes available for citizens and tourists. You will find the bikes in 12 bicycle racks in and around the city center (from May through October). The bikes are locked to the racks with electronic locks which can be unlocked with an electronical card. The cards can be obtained at the Tourist Information Office at the market square. Special tourist cards can be hired for a charge of NOK 90 and a deposit. These cards must be returned to the Tourist Information Office after use. The resort island of Munkholmen, ideal for swimming, sunbathing or a peek at the old monastery, can be reached by boat from Ravnkloa every hour in summer. Make sure you don't miss the last boat home in the evening! The area below the cathedral is the city's main center and is very pleasant area to relax, with plenty of benches. Mostly pedestrianized only. Wireless Internet access is available from the open decks on starboard side of the ship. Just try some of the open connections.